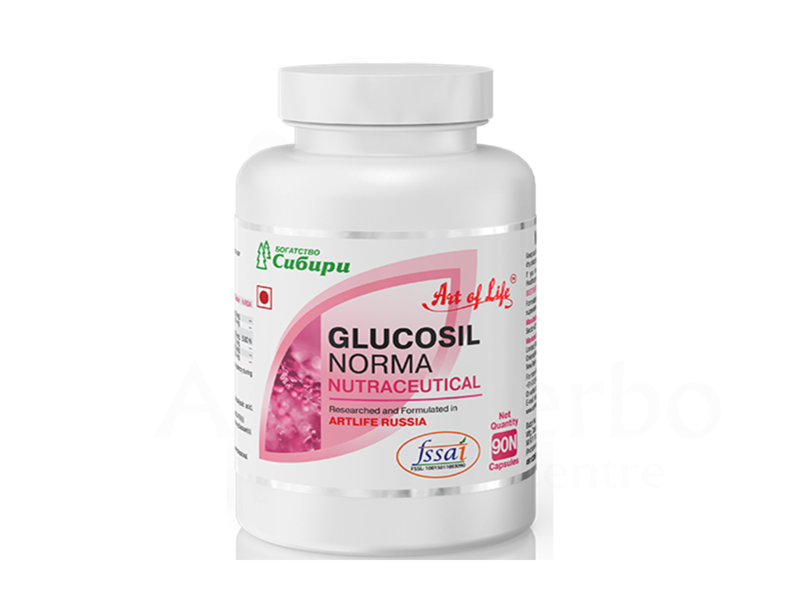 GLUCOSIL NORMA 90 Cap Rs.1199/- BUY! The composition of Glucosil Norma bioactive complex has a positive effect on the metabolic processes in body. Taurine improves metabolic processes in the heart, liver, retina and other organs and tissues; it has also an antioxidant effect. It increases sensitivity of tissues to insulin. Bean shells extract helps to control the level of carbohydrates, thereby supports to maintain a healthy body weight. Garcinia helps to control appetite. Rutin and quercetin strengthen the vessels.which help in improving the general health of pancreas by normalization of carbohydrate and lipid metabolism. ​ Prevention and correction of organism functioning disorders by pancreatic diabetes of the I and II types of different degrees of severity as well as by glucose tolerance disorder. Optimization of carbohydrate and lipometabolism. Deterioration of pancreas functioning and digestive system in general. prevention of atherosclerotic changes in vessels.Gastrointestinal tract chronic noninfectious diseases. Instructions for use, dosage:"Glucosil" is recommended as a health supplement, an additional source of vitamins, mineral substances, flavonoids, tannins. Adults should take 1 tablet 2 times a day with food.